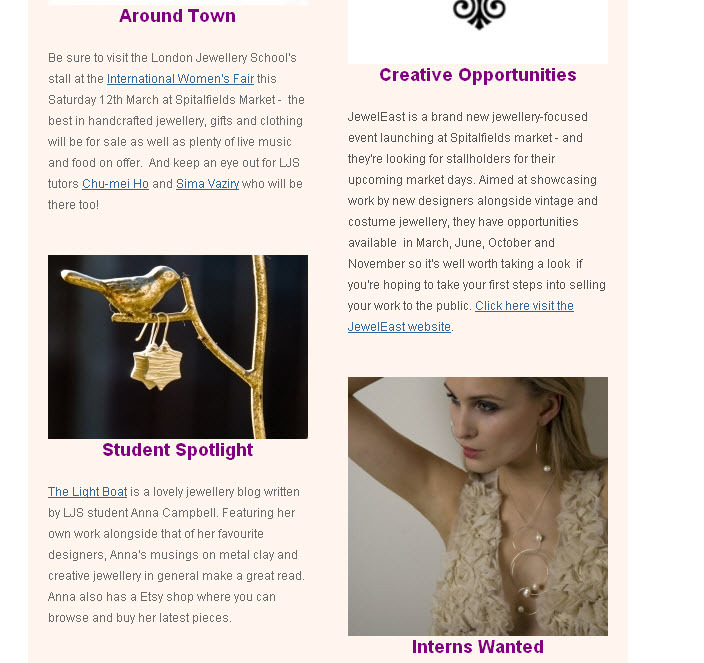 I was very pleased to be contacted by the London Jewellery School who asked if they could feature my blog in their newsletter. Yesterday their March newsletter was distributed and this blog featured in their 'student spotlight' section (see left). And I look forward to doing many more. I originally did a silversmithing course at another jewellery school but when I heard about the existence of silver clay I found the LJS. I knew I wanted to have a go with silver clay and I have been hooked ever since! I have been taught by Emma Ashworth, Julia Rai, Michael Milloy and Chu Mei-Ho at the LJS and have found them all to be excellent teachers with a lot of experience to share. Plus they have very well equipped studios which are very well resourced. I highly recommend taking one of their classes. There is so much choice, you won't know where to start!